Online lessons and videos are included, so you don't even need to read the manual. While the world was busy discovering GarageBand, professional Mac musicians had been given a three-year head start with Ableton's Live. Live is like GarageBand with all the features you always wanted, and then a box load of extras. It works with clips of audio and MIDI and puts them on a 'session' grid. Unlike most sequencers, the grid can be played live, so you can assemble a collection of clips for a verse and a different collection for the chorus and switch between them with a single mouse click. Live is smart enough to interface to most MIDI hardware, so you can attach knobs, buttons, keys and sliders to most of its features for extra performance potential. It's also smart enough to follow tempo and key changes, so you can change the tempo and all of the clips will stretch or shrink to fit it. If you want more conventional and linear music making, you can also switch to an 'arrangement' view, which gives you track-based editing of both MIDI and audio. The arrangement view can remember your playback moves in the session view, so it's a very easy way to demo a song and then rework it later. Everything is editable and there are hundreds of presets, clips, effects, synthesizers and sounds. New in Live 8 are grooves, which change the rhythmic feel of a clip, and an improved audio-warping engine that creates smoother time stretching. Time stretch still needs manual fine-tuning, but the sound quality is getting impressively smooth. New effects have been added for more creative sound editing, including versatile dynamics and multiband compression, a vocoder and a frequency shifter. Rounding off the package are changes to workflow, including improved editing and better crossfades and track grouping. Live comes in three flavours. LE includes a couple of software synthesizers and 20 studio effects. Full offers all effects and adds extra loops, and Suite adds a collection of software synthesizers and more instruments and samples. The boxed version of the programme includes a manual and more sample content. The collection of softsynths includes two samplers, a virtual analogue synthesizer, and a couple of physical modelling synthesizers. The EIC library of presets is good. The preset synthesizer collections are rich, as are the drum, percussion and orchestral sounds. Live 8 would be perfect, but we had problems with CPU spikes and slow speeds and crashes. 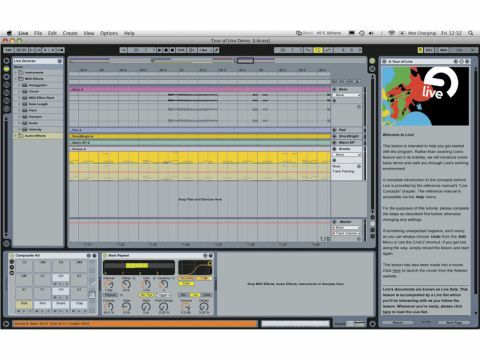 Ableton's record on bug fixes is good, so it's likely these problems will have been fixed by the time you read this. But if you want to use Live 8 professionally, try out the free demo first. Live is an excellent complement to Logic Studio. It's unbeatable for live performance, and gives Logic a run for its money when it comes to studio work. However, its synths aren't as comprehensive as Logic's, and they don't sound as good. The audio and MIDI effects are matched, and Live's clip-based mixing and performance system is unique. Hundreds of pros use Live 8 and it may not be perfect, but it is very, very good.